The Holidays are special; it's a sparkly time of festive decorations, good food, generous offerings, and spiritual traditions. But for some, the holidays drum up feelings of depression or anxiety, and they can be a reminder of the loss of the loved ones who are not present for the celebrations. It’s important to take into consideration that not everyone is Fa la la la la-ing as they may be suffering and trying to just get through the season emotionally unscathed. A few years ago around this time, my friend PG and I were talking about going home to spend the holidays with our families. She said that she sets aside time before leaving the city to 'child-proof' herself. What?! PG explained that she goes home and there are all sorts of triggers with her family. Politics, religion, health and wellness, the past, - controversial conversational topics that bring out the worst in her friends and family back home. Manners are forgotten, words are not minced, toes are stepped upon, and feelings are hurt. What a lesson in self care, right? Family time and time spent with old friends can be tricky. They can bring out our worst qualities. Our most unattractive behaviors. Fuses are short. Patience is scarce. We find ourselves slipping back into childhood patterns or unhealthy habits. It’s easy. It’s what we know. It’s where we came from. But here’s the thing: we’ve all evolved. We’ve all grown up. We’ve all improved. We’ve all discovered our better selves, in small ways and big ways. I’d like to believe that everyone is doing their best with the circumstances they’ve been dealt. Our job is to make sure we bring our best selves in every situation and make room for everyone else to bring their best-evolved self too. And judging how they show up isn’t our job because we have no control over anyone but ourselves. We only have control over our own reactions to the people around us. So what precautionary steps can we take to child proof ourselves to ensure we’ll be present with our loved ones and not get hung up sidestepping possible landmines? We can set boundaries by deciding ahead of time what we are willing to talk about and what situations in which we are willing to engage. We can prepare a few responses to certain hot-button topics so that if/when they come up, we are clear with our opinions, intentions, and beliefs. If things get too stressful we can map out a plan to go outside to take a walk, or go down into the basement for a quick meditation, or simply stand in place while taking some deep breaths. We can have a mental list of safe conversation topics we are willing to engage in with old friends or extended family. We can also have a trusted friend on standby that we can call or text to remind us who we are if we find ourselves slipping back into bratty thoughts, words, and actions. Lastly, we can arm ourselves with some positive affirmations. When someone makes a mindless comment about how you might have gained weight or lost too much weight since they saw you last -- go to the bathroom, look at yourself in the mirror, and say, “I am perfect just the way I am.” Our loved ones just want us to succeed, but they can easily make us feel less-than when it comes to our jobs, our partners, and our accomplishments. 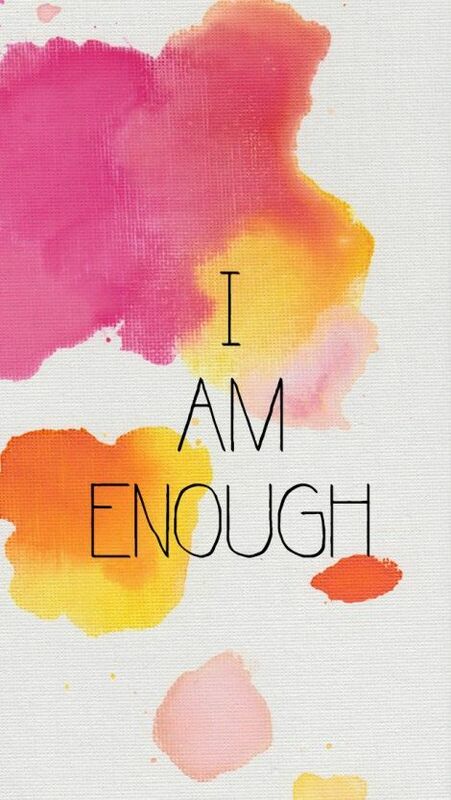 Nod and smile, and whisper to yourself, “I am enough.” Remember, you showed up to this holiday with your best self. As a cook, my job is to make everyone feel safe and cared for at the dinner table. I do my best to honor their food choices, to provide for their dietary needs, and to make sure there’s something for everyone. Holiday mealtime can bring anxiety too. Whether we’re vegan, sugar-free, meat eaters, fasting, or just plain indulging - everyone is going to have an opinion, and we’ll inevitably feel judged. If you know you have something going on with your food world that might raise some eyebrows, prepare for that too. Bring your own dish to ensure there will be something you can eat. 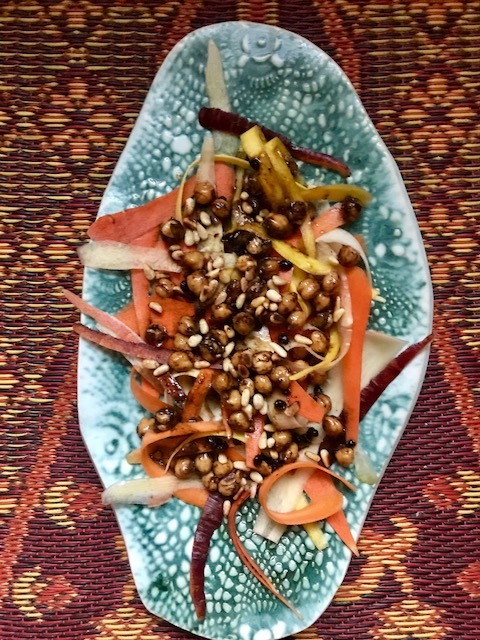 One of my holiday dishes is this carrot ribbon salad. Crunchy raw vegetables with a sweet and tangy dressing and some hearty protein filled chickpeas and toasted pine nuts. The rainbow carrots look like a celebration on the plate. Colorful little flags bringing some cheer when we might need it the most. 5 large rainbow carrots, peeled - if you can't find multicolored, classic orange will still be delicious! Preheat oven to 350 degrees. In a small bowl, combine cumin, 1 tablespoon olive oil, and chickpeas. Season with salt and pepper. Spread the coated and spiced chickpeas onto a sheet pan and roast in the oven for 15-20 minutes until they are crispy. Shake the pan halfway through the cooking time. Use a vegetable peeler to shave the peeled carrots into long, thin ribbons. Combine the currants, balsamic vinegar, and 4 tablespoons olive oil in a small jar that can be closed with a lid. Season the dressing with salt and pepper, and shake well until combined. Toss the carrots in just enough dressing to coat them. Arrange the ribbons on a large plate, scatter the chickpeas and pine nuts on top of the carrots, drizzle the salad with a little more dressing, and serve.